Each year Warrener Stewart recruits a graduate trainee who will continue to progress their career in accountancy through an internship. 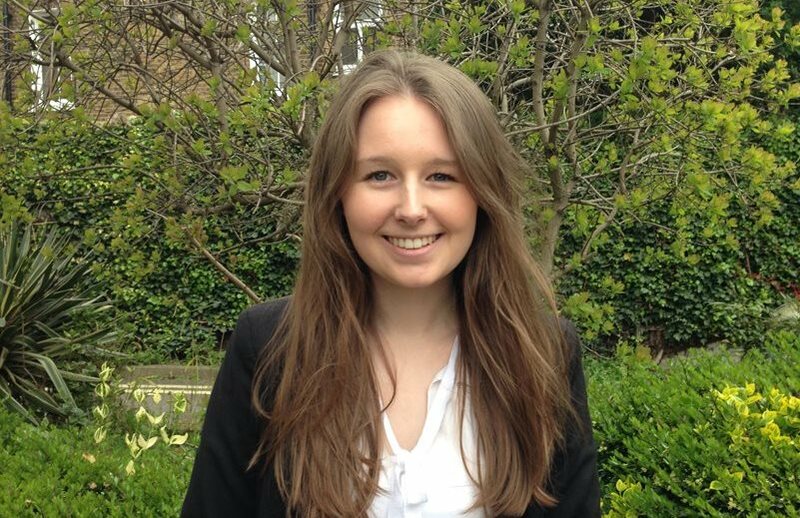 Recent employee, Victoria Dent shares her experience of working at the Fulham based accountants. What degree did you study for? Has this helped you in your chosen career? Yes, not only did it provide me with an understanding of what accountancy was but it also gave me an in-sight into what would be involved in becoming a Chartered Accountant. What made you choose accountancy? From a young age I have always run my own businesses and have had a keen interest in mathematics. Accountancy seemed like an obvious choice as I wanted to learn what was behind the numbers of successful businesses; something that once grasped would be invaluable in aiding the success of my own business. What made you decide to start with Warrener Stewart? I applied to join Warrener Stewart because they work with directly with business owners across a range of business sectors, from large estate agents to smaller retail clients. Working so closely with SME’s would afford me a unique insight into their business. Moreover, Warrener Stewart actively supported me whilst studying towards professional qualifications which was very important to me. What is a typical day at Warrener Stewart for you? Working within the audit team I assist audit managers in gathering evidence, performing tests and undertaking analysis of company information. At Warrener Stewart we spend a great deal of time interpreting a wide range of numbers to ensure we can offer the business owner the best possible advice that will continue the growth of their business. Alongside auditing, I also prepare financial statements and complete various ad hoc tasks in tax and other areas of accountancy. Most definitely the professional relationships that we develop with clients; since few of our clients have a financial director they rely upon us for financial and business advice. Equally, I enjoy the fact that I’m not solely based at our accountancy offices in Fulham, as an auditor I travel to different locations throughout London and the surrounding areas to conduct audits. Once an audit is finalised it is rewarding to receive positive feedback from the client that they are happy with the work undertaken and the way in which it was performed. Can you outline your study/career path? What qualifications are you studying for and when will you qualify? I am studying towards the ICAEW ACA exams to become a chartered accountant. This involves sitting numerous exams as well as completing three years’ worth of accountancy experience. When I joined Warrener Stewart in January 2015 I already had 5 exemptions for the certificate level ACA exams because of the modules I studied at University. Whilst working at Warrener Stewart I have passed four professional exams with the intention of sitting three more this year. If I pass the exams this summer I shall be a part-qualified accountant, with a further three to pass before I am fully qualified. I hope that by January 2018 I will have completed all my exams and be fully qualified Chartered Accountant. What would be your advice to anyone wanting to start a career as a chartered accountant? I would recommend paying attention to what is happening in the world of finance; employers are looking for candidates who are strong with numbers and have a commercial awareness. I would recommend looking at the financial statements for your favourite retail company or football team, read them and think about what those numbers are telling you about the entity’s performance. 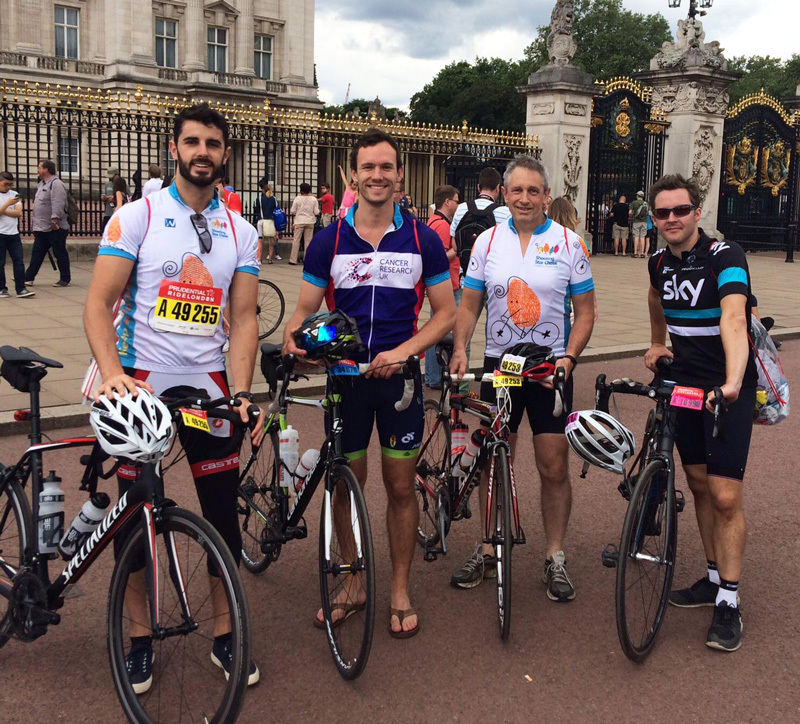 Hoping to beat their previous personal bests, Nick Morgan and Jon Last, from Fulham based accountants, Warrener Stewart, were amongst the 26,000 riders in the Prudential Ride London-Surrey 100 on Sunday 31st July. Both have previously completed the closed road sportive around London and Surrey, firstly in 2014 and then again last year, 2015. This year they were joined by fellow accountants Marcus Bullen and Ricky Morgan, Nick’s son. Team Warrener Stewart all finished the course uninterrupted, despite long delays behind them due to serious accidents. “Whilst the route has remained largely the same, each year we have competed we have had to contend with a number of challenges, including Hurricane Bertha, punctures, injury and, sadly, again this year, avoiding serious incidents and road closures,” noted joint managing director, Nick Morgan. This year the riders raised money for two charities, Shooting Star Chase, a leading children’s hospice charity, who will receive £1,750 and Cancer Research UK who benefit from £1,350. Rather than hitting the tiles after work, Warrener Stewart recently encouraged their staff to strike lucky and hit the pins! Staff were treated to a night of ten pin bowling at a local American themed bowling alley. The company neatly divided into four teams each led by one of the four directors; Colin Edney, Gary Chapman, Nick Morgan and Jon Last. 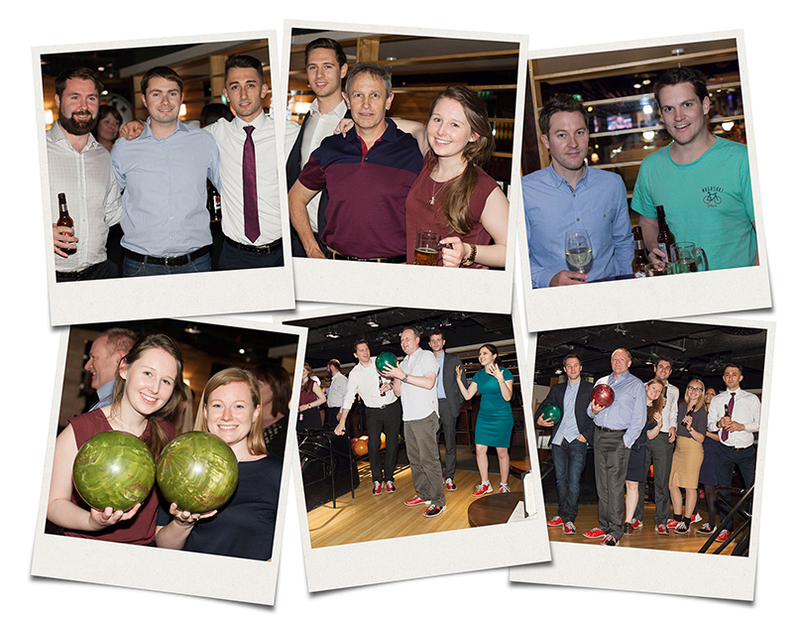 The competition between the lanes was incredibly tense as several staff led with early strikes – including Alex Eagle who claimed to be a novice bowler; whilst others simply watched as their balls rolled into the gutter. It was a clean sweep for the winning team championed by Nick, with fellow team mates, Stuart Barbour, Francis Kershaw, Jack Moody, Ryan O’Connor and Victoria Dent. The other side of victory; Ryan O’Connor, Nick Morgan and Victoria Dent. Bowlers in arms; Jon Last pictured with Colin Edney, Felicity Butler, Alex Eagle, Ashleigh Molton and Jack Moody. 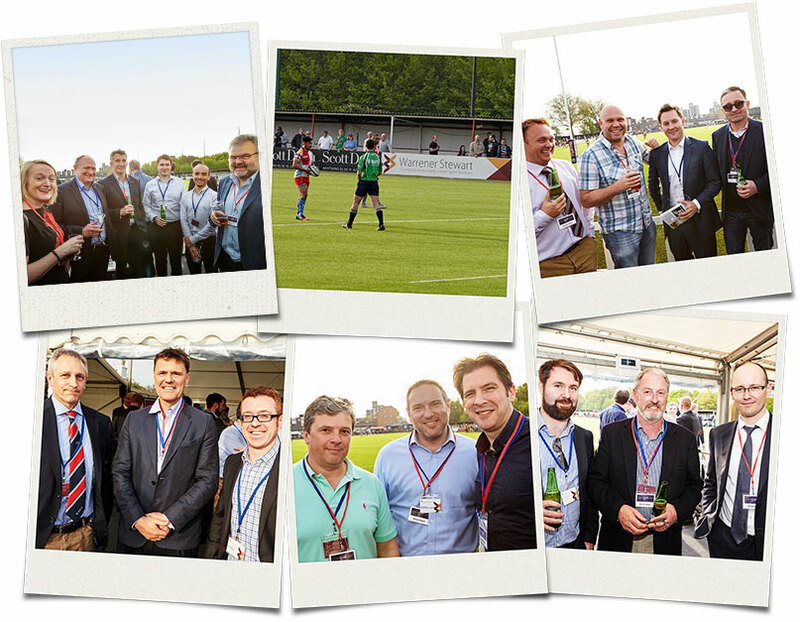 On a balmy evening, last Thursday, 5th May, Warrener Stewart treated guests to a spectacular evening of sevens rugby hosted at Rosslyn Park FC. Winners of the past five years, Harlequins were keen to try and retain the cup and faced strong opposition from sides including London Irish, Worcester Warriors and Rosslyn Park. The hosts of the night, Rosslyn Park, fielded a strong team including one of the Warrener Stewart sponsored players, Harry Broadbent, to reach the final against Ramblin Jesters. Despite a valiant effort from the home side, the Jesters were crowned winners by 26-14. It’s a full house of Rebecca Ferguson of Gordon Dadds LLP, with Colin Edney from Warrener Stewart, joined by David Measures from Carla International, Francis Kershaw, Warrener Stewart, Alex Coote, David Collins Studio and Stephen Fuller also Gordon Dadds LLP. Damian Talbot from Warrener Stewart flanks Geoff Eden of Eden Architects, Jon Last, Warrener Stewart and Nick Smith, Maddox Homes. Keeping on side are Stuart Barbour, Warrener Stewart, with Lee Watts from Kinleigh Folkard & Hayward and Chris Sarsfield, Meaby & Co. Lining up are Rupert Bruce from MinMax Limited with Mark Radford, Templar Financial Planning and Ryan Lane, Warrener Stewart. Backs in waiting, Nick Morgan, Warrener Stewart lines up with Paul Marples, Stockbridge Estates and David Collins, Warrener Stewart.